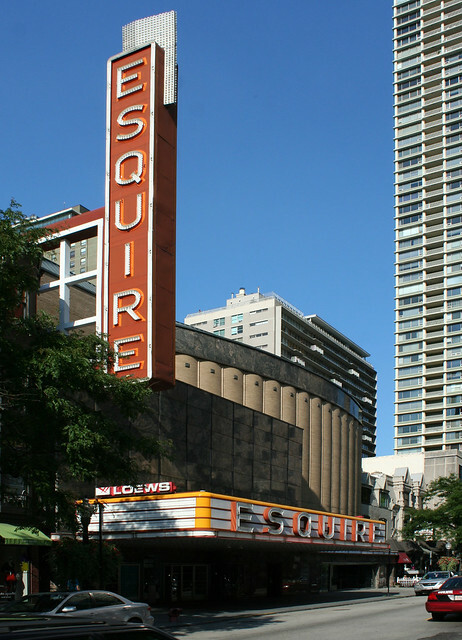 The Esquire Theater was a 1936 Moderne beauty at 58 Oak Street, just off the Magnificent Mile. Ultra-modern for its time, it retained its sleek, clean looks up into the present day. Note the use of past tense. 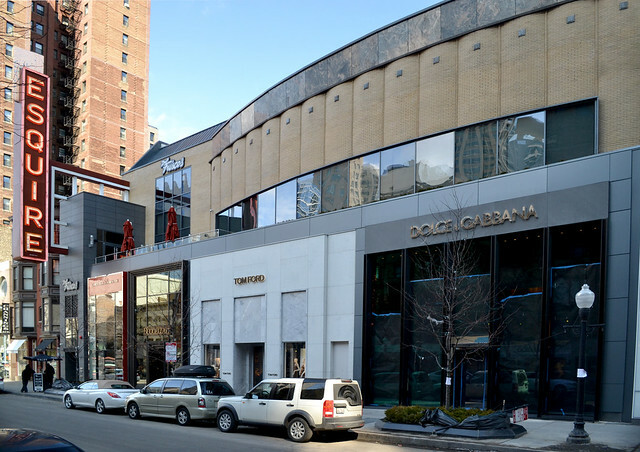 In 2012, the building was converted into a retail and dining complex, housing a mix of stores in keeping with the high-priced shopping along Oak Street. In the process, most of its facade – and its Streamline Moderne style – was obliterated. 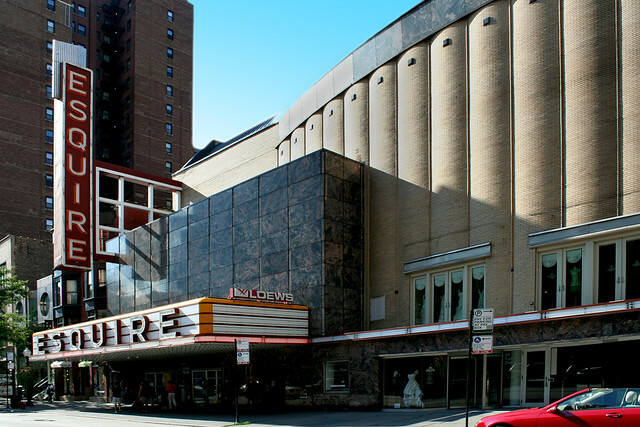 The marquee, the mass of mottled dark granite, the checkerboard grid of the vertical sign supports, the grain elevator styled bulge of the auditorium – all gone. In their place, more of the same bland minimalism that passes for elegance on Oak Street. 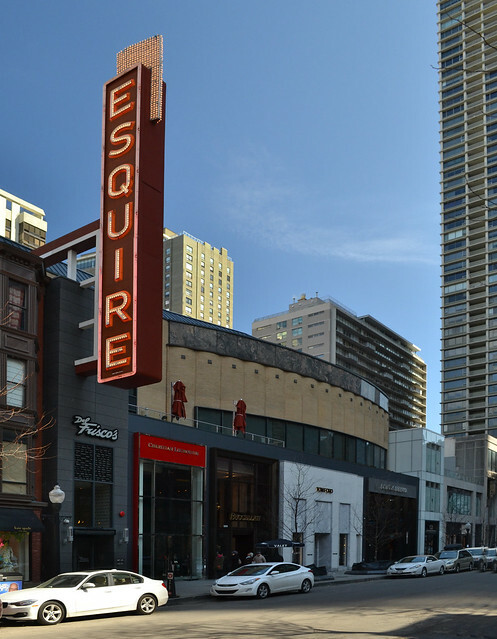 Considering the incredible elegance of the original interiors, it’s ironic that the owners chose to gut the building to accommodate top-tier retailers today. Those interiors were lost in a 1989 remodeling, but imagine recreating that space as a boutique mini-mall. That would be some high-end shopping! Also lost in the remodeling: a couple of Victorian houses with Gothic detailing; they were demolished and replaced with a three-story building whose storefronts match the dullness surrounding them. 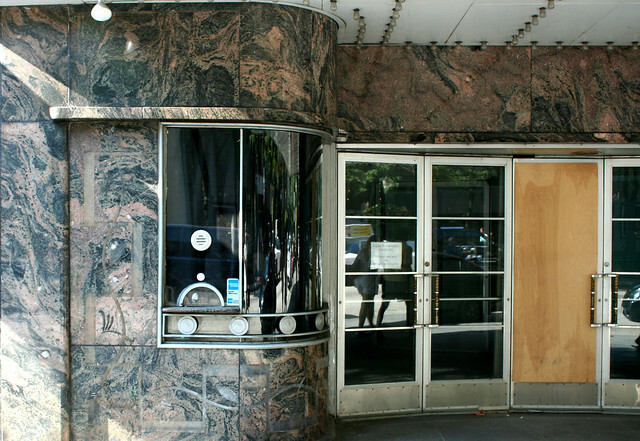 This entry was posted in Art Moderne, demolition, Preservation & Renovation, theaters. Bookmark the permalink. I was in Chicago last year and took a stroll down Oak Street. I couldn’t put my finger on what had changed but it was missing some of its allure. Though still a beautiful street, the town homes always gave it the charm I loved. 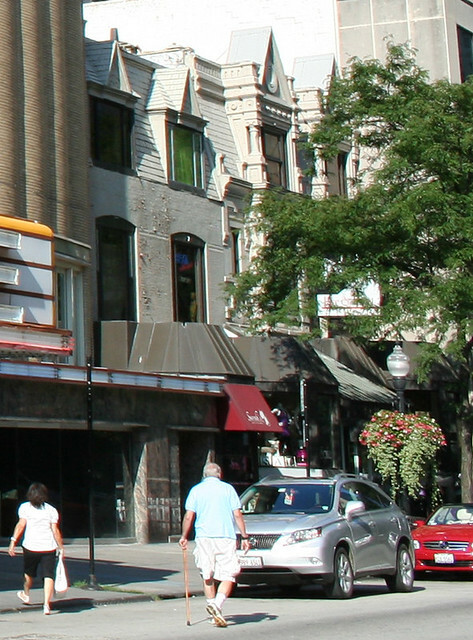 My friends wanted more of a neighborhood shopping experience, (translated:more affordable shopping), so we wound up on Armitage and Fullerton and then a nice walk over to Old Town. Definitely not the Old Town of my youth but it was a beautiful walk. And, great to see all the town homes that had been restored and some of the newer ones that replicated the look of the turn of the century home.